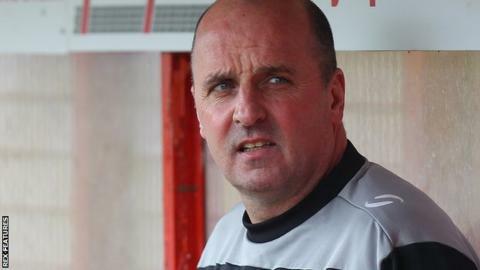 Portsmouth boss Paul Cook says his side might as well be "five points off the moon" as they fell further behind the League Two automatic promotion places. Pompey drew against Mansfield on Saturday, a result that leaves them five points off the top three. "I'm very disappointed with the game, with how we played and very disappointed with us in general," Cook told BBC Radio Solent. Sixth-placed Portsmouth have nine league games left - with five at home. "We might as well be five points off the moon," Cook replied when asked if hopes of automatic promotion were still alive. "If people keep looking for it, I'll keep believing. But, we're so disappointed with how we're playing. "We've just got this ability at the moment to not keep clean sheets and not create chances." Pompey face Notts County at home on Good Friday and Wimbledon away on Easter Monday. "We've got to bounce back against Notts County," Cook said. "It's a big weekend, Fratton Park will be packed and we've got to make our fans believe in us."